This is a story about Yorkshire and its people, from the earliest period up to recent times. Foremost it is a story about invasion. Archaeological finds have shown that Yorkshire was occupied at a time when early hunters from continental Europe were not supposed to have ventured so far north. Archaeological finds have shown that Yorkshire was occupied at a time when early hunters from continental Europe were not supposed to have ventured so far north. Growing populations on the European mainland made Yorkshire’s fertile land and receding woodland a prime landscape for these first European farmers, and over time they would be followed by waves of invaders intent on pillage and land grabbing. From the north and west came the Picts and the Scots, while the Romans, Angles and Vikings arrived via the River Humber. The Normans would be the last to invade and seek to dominate everything they saw. 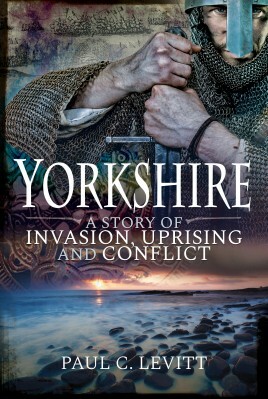 Each invasion would leave its stamp on Yorkshire’s culture and life, while battles would later be fought on Yorkshire soil during both the Wars of the Roses and the English Civil Wars. More than just a romp through the ages, this book reveals the key places where battles were fought and Yorkshire history was made. Born into a military family in the historic market town of Beverley, East Yorkshire, Paul Levitt has always been intrigued by the past. He developed a keen awareness of Yorkshire’s rich heritage as a schoolboy and developed a particular interest in the medieval period. Yorkshire’s unique landscape and especially the North York Moors made a strong impression on him and to this day remains a magical place. He has written professionally on a wide range of subjects for the past 25 years.